Thunder Dragon is an archetype based around the eponymous Thunder Dragon. First released in 2002 in Metal Raiders, Thunder Dragon received legacy support over a decade later in Soul Fusion. This legacy support focuses around Thunder monsters that discard themselves from hand to activate effects, as well as gaining effects when banished or sent from field to grave. These discards fuel the fusion summoning of the Thunder Dragon boss monsters, Thunder Dragon Colossus and Thunder Dragon Titan. The deck’s strategy revolves around explosively summoning multiple Colossus backed by a Titan to limit the opponent’s counterplay options. Thunder Dragon took 9 of the top 32 spots at YCS Niagara Falls, the first premier event following Soul Fusion’s TCG release. The deck is clearly Tier 1 at the moment. That said, the format is still undefined and may be prone to shifts. Thunder Dragon will likely remain Tier 1/2 based on the results of YCS London and Pasadena, but it is too early to clearly define Thunder Dragon’s place in the metagame. A few variations on Thunder Dragon builds have cropped up in this early part of the format. We’re going to look at a couple topping lists from YCS Niagara Falls, one relatively “standard” Thunder Dragon build and one more unorthodox variant. The first list is Jake Quinsee’s build that reached the semifinals of YCS Niagara Falls. Quinsee’s build contained what has quickly become the accepted standard for Thunder Dragon maindecks- 3 of each Thunder Dragon monster, 3 Batteryman Solar, 3 Gold Sarcophagus, 2-3 Thunder Dragon Fusion and Instant Fusion, and 3-6 handtraps in the main. Quinsee also chose to main two copies of Allure of Darkness, a card useful for cycling through the deck and triggering the banish effects of Thunder Dragonroar and Thunder Dragondark. What’s most interesting about Quinsee’s list is his decision to run a small Chaos Dragon lineup. Two Black Luster Soldier – Envoy of the Beginning allow Quinsee to push for game out of nowhere, Darkest Diabolos, Lord of the Lair summons itself off when Dragonroar and Dragondark get tributed for the summon of Colossus and Chaos Emperor, the Armageddon Dragon can fetch a banished Diabolos back to the hand to be reused. Both Diabolos and Chaos Emperor serve as extra Allure targets, and the three Chaos monsters can trigger Thunder Dragon banish effects with their summons. The Chaos Dragon engine not only synergizes with the main Thunder Dragon strategy, but provides sheer power in its own right. Quinsee’s extra deck is relatively standard; he opted to play the normal 2 Titan instead of the occasionally-seen 3. Borrelsword Dragon was also included to give the deck the finishing power it sometimes lacks. The side deck was primarily built for Gouki and the mirror match, as evidenced by the inclusion of PSY-Framegear Gammas, Mind Controls and Super Polymerization. Twin Twisters is a nod to Sky Striker and Trap decks. Finally, Sauravis, the Ancient and Ascended is insurance against opposing Mind Controls, Widow Anchors, and Infinite Impermanences. 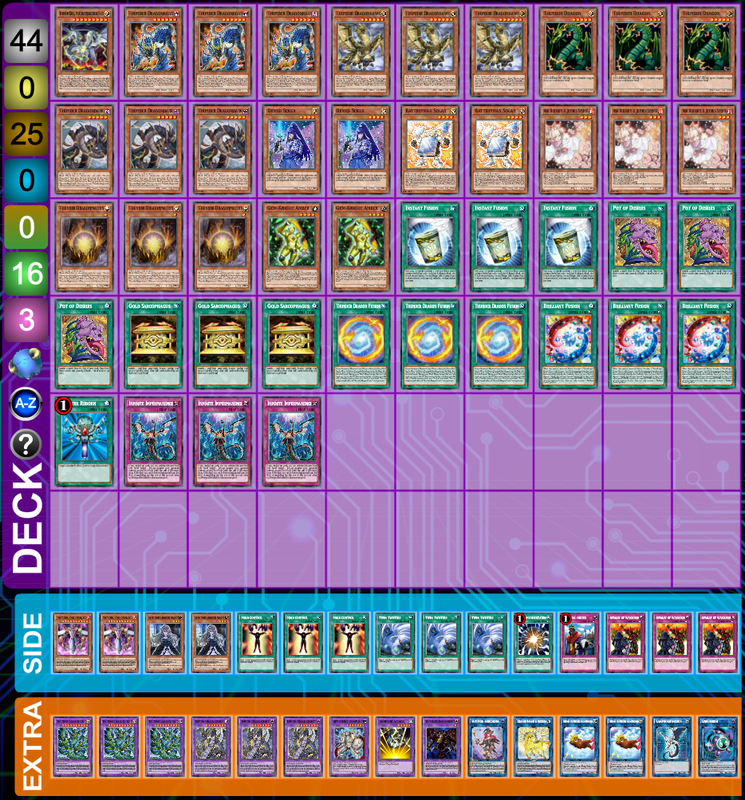 The second list we’ll look at is Bohdan Temnyk’s Brilliant Thunder Dragon concoction that got top 32 at Niagara. As we can see, Temnyk’s list is much more experimental than Quinsee’s. Temnyk is only playing 2 copies of Batteryman Solar, and in his deck profile he commented that he finds Solar a subpar card. Ghost Belle & Haunted Mansion has also been relegated to Temnyk’s side deck. Temnyk has chosen to maindeck Denko Sekka as insurance against backrow-heavy decks. He also mained a single Thunder King, the Lightningstrike Kaiju due to its interaction with Thunder Dragon Fusion. The inclusion of Pot of Desires symbolizes Temnyk’s higher-risk, higher-reward mindset when compared to Quinsee’s more standard build. The crux of Temnyk’s unorthodox strategy is the Brilliant Fusion engine. Gem-Knight Amber is a Thunder monster that can be used to fulfill Colossus’ requirements, and more importantly Gem-Knight Prismaura can be used to summon Titan without tributing a valuable Colossus or using the normal summon. By running the Brilliant engine, Temnyk essentially played six copies of Instant Fusion in his main deck. This is reflected in his usage of three Titan, as his deck is intended to summon Titan as early and often as possible. The Link lineup is very bare-bones, as Temnyk chooses not to run Knightmare Phoenix, Topologic Bomber Dragon, or Borrelsword Dragon, trusting to his Fusion monsters to carry him to victory. The side deck is similar to Quinsee’s, but Temnyk eschews Gammas and Sauravis for Imperial Order and Metaion, the Timelord. Imperial Order is another layer of insurance against Sky Striker. 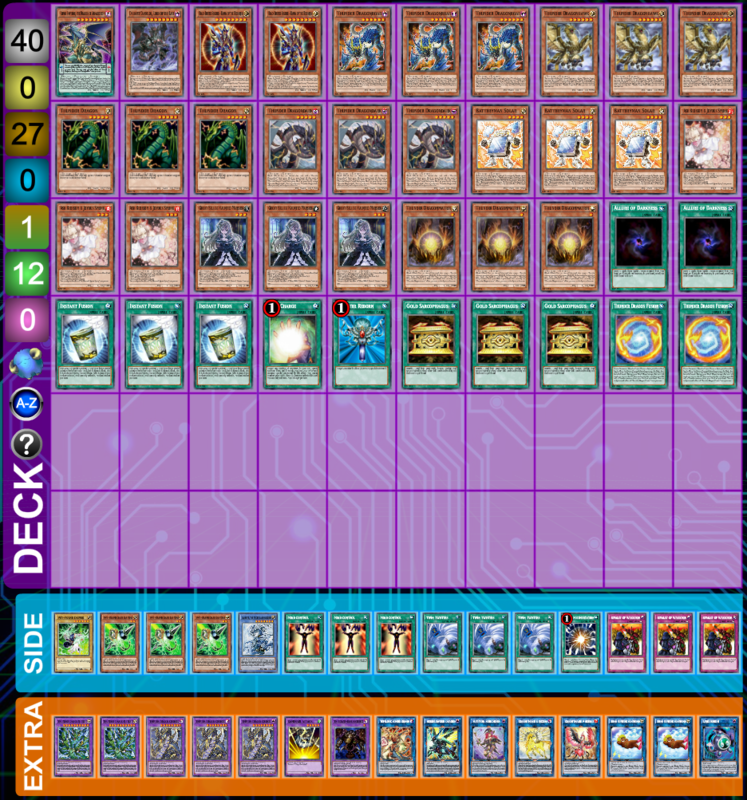 Metaion is intended to be used against Gouki, but Temnyk admitted in his deck profile that the card is often stymied by Knightmare Corruptor Iblee. Thunder Dragon is still a deck based largely off underdeveloped theory, so many tech ideas are currently floating around. It is not clear at the moment which current techs may solidify themselves into outright staples. Synergistic engines like the Brilliant and Chaos Dragon engines are seeing success at premier events already. Card and engine techs tend to revolve around synergy with the deck’s various archetypal effects, or Type and Attribute. Allure of Darkness is a common tech, as it triggers the banish effects of Dragondark and Dragonroar. Allure can often be a dead draw, however, as the standard build generally only plays 6 Dark monsters. Some duelists have taken to using Phantom Skyblaster to provide more Allure targets and offer opportunities for OTKs. Radian, the Multidimensional Kaiju is another Dark option, that unlike Thunder King can be attacked over by Titan. 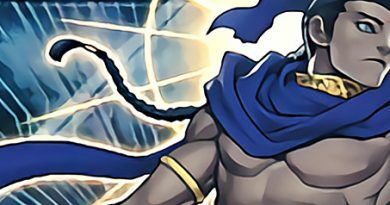 Denko Sekka is a Thunder normal summon alternative to Batteryman Solar that assists with going second especially against backrow decks. Red Reboot is another option against these decks that synergizes well with OTK cards like BLS and Skyblaster. Forbidden Lance has been seeing consideration due to its ability to protect Colossus and Titan from cards like Mind Control. 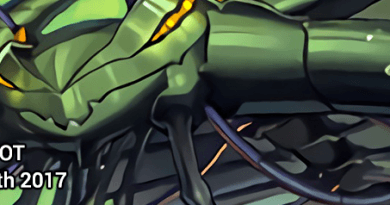 One card that has especially been generating interest among duelists is Chaos Dragon Levianeer. Levianeer can trigger the effects of multiple Thunder Dragon monsters with its summon, as well as generating Colossus fodder or breaking the opponent’s board. It can also serve as a damage finisher much like Black Luster Soldier. The Thunder Dragon mirror match largely revolves around whose Colossi and Titans are sticking to the board. Thunder Dragon relies on searching with cards like Dragondark and Thunder Dragonmatrix, so Colossus is vital in the mirror. Ghost Belle is the most effective handtrap in this matchup. Going first is vital in the mirror, as the first player to establish Colossus with protection has a commanding position. Unless a Thunder Dragon player is running a Chaos Dragon engine, the only realistic way for them to out multiple Colossus and a Titan is with Fusion monsters of their own. Careful usage of Titan’s pop effect is thus crucial to keep opposing Fusions off the board. It’s also worth noting that Titan’s effect activates when either player activates a Thunder effect in hand. Conversely, a Thunder Dragon player running Kaijus should prioritize opposing Titans for their summon. Pot of Desires is a liability in this matchup, as the mirror often develops into a grind. The loss of resources from Desires can thus spell the difference between victory and defeat. Thunder Dragon is not as harmed by Topologic Gumblar Dragon as most decks. That said, it is always best not to be staring down a Knightmare extra link with 2 cards in hand. Handtraps are at their most important in this matchup to prevent this. Thunder Dragon cannot effectively break a full Gouki board going second. On the other hand, Gouki struggles to play with multiple Colossus and a Titan on board. As is usual this format, the player going first has a massive advantage. Your goal should be to brute force multiple Fusions on board even if it costs you advantage. Once Gouki is staring down 2-3 Colossus and a Titan, the game is usually over. Multiple Thunder Dragon Colossus spell doom for Sky Striker. The Thunder Dragon player must predict Evenly Matched, Forbidden Apocrypha, and/or The Winged Dragon of Ra – Sphere Mode in games 2 and 3 and side accordingly. This matchup is relatively simple. The Thunder Dragon player wants to stick as many Colossus as possible to the board. The Striker player wants literally anything but that to happen. Striker players will attempt to grind out advantage quickly in order to keep Colossus’ field presence to a minimum, and to have multiple Widow Anchors at the ready in case Colossus does hit the board. Kaijus are extremely useful in this matchup to shut off the Sky Striker spells. Going first is at a premium here, as Striker faces an uphill battle if Thunder Dragon makes 2-3 Colossus. Before Thunder Dragon was released in the TCG, OCG results implied that it had a poor Altergeist matchup. And this was true- due in large part to the OCG’s 3 Maxx “C”. 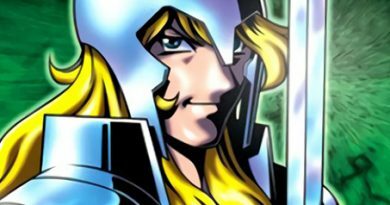 OCG Thunder Dragon decks were limited by Maxx’s existence, and OCG builds did not often summon multiple Fusions. This allowed Altergeist to deal with Thunder Dragon boards through Altergeist Silquitous and Altergeist Meluseek. In the TCG, Altergeist struggles just as much as any other deck to deal with 2-3 Colossus and a Titan. Silquitous and Meluseek are simply not enough to deal with the Fusions before the Altergeist player is overwhelmed. Altergeist builds are taking to playing Traptrick to set Forbidden Apocrypha or Dimensional Barrier from deck. Red Reboot stops these Altergeist plays in their tracks, and Twin Twisters and Heavy Storm Duster can be used in the Altergeist player’s end phase to pop their anti-Thunder Dragon traps before they can ever be used. This is a dangerous (heh) matchup for Thunder Dragon. Thunder Dragon does not main large amounts of handtraps that can stop a Danger! FTK. The main handtrap that does stop Danger!, Droll & Lock Bird, is not useful in Thunder Dragon due to being superfluous with Colossus. Even if Thunder Dragon goes first, if it fails to summon Titan then Danger! Cannon Soldier can OTK through Colossus, as the Danger! strategy does not require searching. Despite its superfluousness, Droll may be worth considering if Danger! FTK proves itself to be a stable force in the meta, as no other handtrap reliably stops the FTK. Going first, Titan is a must-have to remove Firewall Dragon and Cannon Soldier as soon as possible.